The possibility of detection of suppressor genes methylation in circulating free DNA (cf-DNA) of cancer patients and the lack of methylation in healthy individuals makes this epigenetic alternation an ideal diagnostic marker of neoplastic processes. Moreover, hypermethylation in several genes promoter was described as a biomarker of lung cancer. Methylation in the gene encoding doublecortin-like kinase 1 (DCLK1) is observed in patients with colorectal cancer and cholangiocarcinoma. However, there are no studies concerning DCLK1 methylation in lung cancer patients. The aims of the study was to evaluate the frequency of DCLK1 promoter methylation in cf-DNA of lung cancer patients and of healthy persons as well as the usefulness of this test for predicting the lung cancer course. 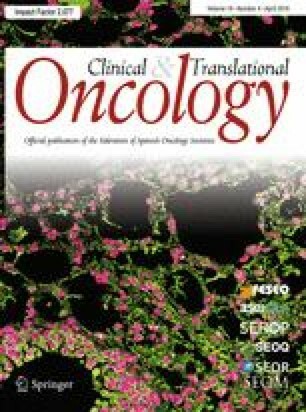 DCLK1 methylation status was evaluated in DNA isolated from peripheral blood plasma from 65 lung cancer patients and 95 healthy individuals. After DNA bisulfitation, DCLK1 methylation was determined using the qMSP-PCR technique. Moreover, the presence of DCLK1 methylation was correlated with the overall survival (OS) probability of lung cancer patients. DCLK1 promoter methylation was detected in 32 lung cancer patients (49.2 %) and 8 healthy individuals (8.4 %). The methylation of the region before transcription start site (TSS) and the region after TSS of DCLK1 gene was detected in 28 and 11 patients, respectively. In seven cases (10.8 %), the DCLK1 promoter methylation in both regions was reported simultaneously. The methylation was observed slightly frequently in patients with small cell lung cancer (75 % of SCLC patients). The median overall survival of patients with DCLK1 promoter methylation was lower than that of patients without DCLK1 gene modification (p = <0.001, HR = 4.235). The evaluation of DCLK1 promoter region methylation may be useful in both early diagnosis and prediction of the course of lung cancer. The study was sponsored by the Polpharma Scientific Foundation. Informed consent was obtained from all individual participants included in the study. The research involved human participants.